This is part of the conference “Building Partnerships Between Archives and Indian Communities,” held at the American Philosophical Society (APS) in Philadelphia, May 2010. “Welcome Song,” Elder Watie Akins, Penobscot Nation. Timothy Powell, director of special American Indian projects for the American Philosophical Society, holds a microphone for Watie Akins of the Penobscot Nation during "Welcome Song." / Michael S. Wirtz, Philadelphia Inquirer. “Pipe Ceremony.” Larry Aitken, Tribal Historian of the Leech Lake Band of Ojibwe. Following is a photo gallery of the Pipe Ceremony, all photos by Frank Margeson, Copyright (©) 2010 American Philosophical Society. This part of the conference “Building Partnerships Between Archives and Indian Communities,” held at the American Philosophical Society (APS) in Philadelphia, May 2010. Robert Miller, Prof. of Law at Lewis and Clark School and Chief Justice of the Court of Appeals of the Grand Ronde Tribe. “This is an historic moment, a chance to truly share materials together to preserve Native languages and cultures. “But last week, at a lecture in San Antonio someone asked me, ‘Shouldn’t you just join the Melting Pot and become a regular American?’ My answer is: Absolutely not! Native Americans do not want to lose their language and culture, which makes them separate from Americans and the Melting Pot. But many feel like they are living in two worlds – one of speaking English and being American, and the tribal pull. “Preserving language is absolutely crucial – language is the key to a separate existence and distinct culture. The English language does not reflect the meanings, ways and degrees [in Native languages]. This is not an academic exercise – it’s about keeping the culture alive for the next generation, and the next 1,000 years. “When Columbus stumbled into the Caribbean in 1492, there were 300 Native languages. In 2000, there were 175 alive in 29 states. But of those 175, only 11 percent were still spoken; of those still spoken, 40 percent were only by the grandparents, and 17 percent only by the parents. In 10 years (this year), it was predicted that 75 percent of the languages would be extinct. The remaining languages are in a precarious existence. “For the Navajo, in 1980, 90% of 6-year-olds could speak the language, but in 2000 it dropped to 30%. Did television rob them of their language and culture? On the Pine Ridge Indian Reservation, there are 29,000 people but only 5-15% of them are fluent, and of the speakers, 60% are 50 or older. For the Pawnee, in 1965 there were 200 fluent speakers, but the last died in 2006. The loss of language directly leads to the loss of religion, culture and ceremonies. “How did that happen? This was the goal of the English, French and Spanish. Though the first Bible was translated [into Native languages], soon after they taught English to assimilate the Indian people. From 1819-1873, Congress supported the Civilization Fund that provided schools on and off the reservations. These schools took children away from 5-18 years old, punishing them when they spoke their own language. In 1869, the schools required them to practice Christianity, and in 1875 all Bureau of Indian Affairs (BIA) schools required all communication to be in English. In 1868, the BIA decreed: ‘Sameness in language leads to sameness in thought and sentiment.’ In 1877, there were 170 BIA schools, while in 1909 there were more than 300. Now there are 85 schools. “Thomas Jefferson wanted to prove where the Indian people came from. He collected vocabularies from all of the tribes east of the Mississippi, and told Lewis and Clark to collect vocabulary lists. The vocabularies were unfortunately lost when Jefferson moved to Monticello in 1809. Lewis and Clark also collected a questionnaire of every tribe, including military intelligence. Jefferson was the father of the ‘Removal Era.’ Lewis and Clark found out which tribes would be willing to move west, and also which tribes in the west would accept tribes moving from the east. “What are the tribes doing? Some are in business development, such as by building casinos. Some languages are being revived, for example Chinook Jargon is being taught, even though it’s a trade language with French, English and Spanish words. Sioux boys as they arrived at the Indian Training School, Carlisle Barracks, Oct. 5th, 1879. / Frank Speck, APS Speck-Choate Photograph Collection. “Tribes must teach younger children their language. The Blackfoot’s Piegan Institute practices language immersion, which is the only way to teach, especially for the first five years in a child’s life. Tribal schools have low attendance and high dropout rates. But if they taught the tribal languages in high school, who would be the A student then? It validates the minority people who do not read about themselves in American history textbooks. “What is the federal government doing today? In 1972, the Indian Education Act supported bilingual education for Indian schools. But 36 states have English-only curricula, and Arizona recently banned ethnic studies programs. In 1990, the Native American Language Act (NALA) said that the United States has a responsibility to act together with Native Americans, and awards special status to Native Americans, including recognizing that separate identity and language are integral to the survival of Indian culture. Student achievement and school pride are tied to the first language of the child. Indian languages should be taught at the elementary, secondary and higher education levels. Indian boys (from 16 different tribes) at the Indian Training School, April 20th 1880. / Frank Speck: APS Speck-Choate Photograph Collection. “Oregon passed a law letting the tribes certify who can teach their language, and that it can’t require any certification or bachelor’s degree. Washington state passed the same in 2007. Since 1992, NALA has awarded only $13 million in 166 grants, only about one-fifth of the $63 million requested. A Senate report showed that this was only policy, and not required by the United States. This shows that the 50 states are not dependable. Tribal people can’t wait another 200 years for U.S. to help them. “Indian students who see themselves in the curriculum helps reduce the dropout rate, just like how a recent Oregonian article showed the same for Latino and African-American students. “Introduction.” APS Executive Officer Pat McPherson. “As the founding director of the First Nation Studies Program, I can tell you that universities are reawakening the protocols of collaborative partnerships. APS is pivotal for the study of Native American languages and to some extent, of Native Peoples. Thomas Jefferson, Third President of the United States. He recorded Indian vocabularies. / APS Prints Collection. “[America’s] Founding Fathers classified the indigenous population as a ‘cabinet of curiosities,’ categorizing them in the natural science field as part of Enlightenment thinking. They also amassed data on the languages of the peoples of America. The Founding Fathers prized something ‘American’ over the Old World, and identified with Native Americans such as by dressing up as them for the Boston Tea Party. “Early APS Members who were anchored in philosophy did not conduct anthropological fieldwork, though Wilhelm Van Humboldt called for the need to have accurate data numbers on the languages. “In the book ‘Jefferson and the Indians,’ it tells of Jefferson admiring the freedom of native people living outside of civilization. He thought of the Indians as noble but disappearing, and thus needed records to be available for study of them. Jefferson’s Indian vocabularies was lost in 1809 when he moved to Monticello, but there are remnants at the APS. He recognized the diversity of the Indian languages, and thought that they were the key to the affinity of nations, though he collected mostly Algonquin vocabularies. Jefferson's Indian Vocabulary List. List of words, in English, with space for listing the Indian equivalent, 1792. / APS American Indian Vocabulary Collection. “Jefferson’s vision of science is at the core of the APS. Jean Duponceau classified Indian languages on grammar rather than vocabulary, but Jefferson rejected that. But both were mistaken. John Pickering designed a uniform orthography. Albert Gallatin created a map of linguistic groups and a vocabulary. Henry Schoolcraft made Ojibwe narratives. Lewis Cass advised Jefferson on the Lewis and Clark expedition. Daniel Brinton transcribed the Iroquois Bill of Rights, made migration legends and kept Philadelphia on the map for professional anthropology. “Brinton became the first anthropology professor in the country at the University of Pennsylvania. In 1894 he presented at the World’s Fair, and was the first to include South American languages, drawing the hemisphere into a single fold. Franz Boas, whose base remained in academia, wrote the 1911 “Handbook to American Indian Languages.” Through the 1920s, he developed and catalogued based on fieldwork, demonstrating that each language has its own structure. “Greeting.” Chief Glenna Wallace, Eastern Shawnee Tribe of Oklahoma. “The Shawnee are originally from the area. In 1682 we met with William Penn, and again in 1701 with the Indian Tribal Conference. We were forcibly removed from our indigenous land in Ohio in 1832. We were the first tribe after the passage of the 1830 Indian Removal Act. We made the 700-mile trek to Oklahoma. Who we lost and how many, we do not know. Session 4: Where Do We Go From Here? We live in an historical era in which new possibilities have arisen for collaboration between archives, museums and indigenous communities. Yet, tremendous challenges lie ahead that must be addressed. This session concerns the issues of technological resources for curatorship in indigenous communities. But sometimes that it is not a simple process. Black and white group portrait of Native American (Zuni) children, two girls and two boys, wearing traditional clothing; ca. 1880. Frank Speck/APS. Shankhar used the example of the Zuni tribe, who wanted to use the recorded language files for cultural and linguistic education. But the Zuni did not have the IT specialists or digital resources to host the files on their own servers, and transporting the materials by CDs or DVDs presented issues of security and long-term preservation, Shankhar said. One person who does speak the language of archives and technology is Kimberly Christen, an assistant professor at Washington State University’s Department of Comparative Ethnic Studies. Christen has developed the Mukurtu Archive for the Warumungu community in Tennant Creek, Northern Territory, Australia, and is currently working on the Plateau People’s Web Portal, a similar online archival project developed with Washington State University and the three Pacific Northwest tribes of the Coeur d’Alene, Umatilla and Yakama. The open-source software could be adapted by any indigenous community. Because digital technology can be reproduced so precisely and transported so inexpensively, it has created exciting new possibility for moving materials from archives back into indigenous communities. This session focused on two groups: Pueblo Isleta developing a traveling exhibit, and Pimachiowin Aki, a proposed UNESCO World Heritage Site in Canada. Time Exposures: Picturing a History of Isleta Pueblo in the 19th Century, is a traveling exhibit developed by Isleta Pueblo traditional leaders. They faced the challenge of telling the history of the Isleta people from their point of view, without revealing information that would diminish the privacy or integrity of their lives, practices and beliefs, said Stephanie Zuni, from the Isleta Pueblo Cultural Affairs Office. The exhibit of 300 photos is divided into: the cycle of the traditional year, the arrival of Americans and how it disrupted Isleta life, and examining the photographs themselves as products of white culture. Pimachiowin Aki is a proposed UNESCO World Heritage Site, a partnership between four First Nations (Pikangikum, Poplar River, Pauingassi and Little Grand Rapids) and the governments of Manitoba and Ontario, Canada. Its boundaries would contain 40,000 sq. km of vast boreal forest, rivers, lakes and wetlands. 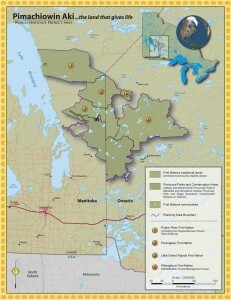 Map of the proposed Pimachiowin Aki UNESCO World Heritage Site, a partnership between four First Nations and the governments of Manitoba and Ontario, Canada. “The Poplar River Ojibwe are using APS photographs to preserve 40,000 acres of land, on the east side of Lake Winnipeg,” said Sophia Rabliauskas, spokeswoman for the Pimachiowin Aki Corporation. “Developers wanted the land for logging and hydro-development, but the community was against it,” Rabliauskas added. “The elders knew we had been there for thousands of years, but we needed to document that. Archaeologists showed that we been there for 6,000 years.